As we move toward luxurious style that lasts, and is both unique and durable, it’s a time to rediscover quality and impeccable resilience in wool floor coverings. Our European counterparts have long held wool as the standard for fine carpeting and it continues to be the top choice for discerning clients who desire beautiful color, warm texture and quality floor coverings that will enhance their interiors for years to come. On a recent trip to England to visit the sheep farmers and manufacturers of fine floor coverings, it became increasingly clear why the Brits choose wool floor coverings 90% of the time to adorn the floors of their quaint homes. In a climate well known for its rain and dreariness, European designers and clients want floor coverings that are natural, soft and plush and have the ability to withstand the constant grime, wet and dirt that their seasons kick up. The amazing resilience of wool is driven by their malevolent climate and is what makes it the perfect choice for floor coverings. The harsher the climate, the more resilient sheep’s wool is forced to become in order to protect against the elements. 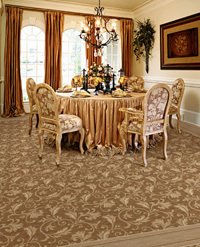 Wool floor coverings, such as those in the Dabbieri Collection, used to be accessible only to the well-to-do. As the cost of resources used to make synthetic floor coverings continues to rise, coupled with our growing interest in natural, renewable floor coverings, wool’s quality, value and natural green appeal make it a top choice for any budget.